In 1963, 11 Sisters of St. Joseph Benedict Cottolengo received a personal invitation to Miami from Coleman Carroll, the Catholic Archbishop of Miami. St. Joseph Benedict Cottolengo is a congregation renowned in Italy for its work with people who have developmental disabilities. When the sisters traveled from Italy to Miami in the winter of 1963, they immediately saw what the archbishop had gone to Italy to describe: a great need among the children of Miami. Within a few months, the sisters were among many others organized by the archbishop, fulfilling his vision for the Archdiocese of Miami to start a school for students with developmental disabilities. Work quickly began on 50 acres of “rundown property” in northwest Miami, and the archdiocese overcame the challenges, opening the Marian Center to students in the fall of 1964. For the sisters, it would be the first mission of its kind beyond European borders. Today, this school is referred to by some as the hidden jewel of South Florida. Today, the Marian Center provides educational, residential, clinical, vocational, and recreational services to more than 150 students ranging in age from birth to middle adulthood. Its seven buildings are set like gemstones among a lush landscape with palm trees swaying in the wind. Every awe-inspiring detail is now a legacy of grace and care for the people of Miami thanks to the 11 Sisters from Italy whose faith and inspiration changed Miami for the better nearly 50 years ago. “We thank God for the contributions of those amazingly devoted women and are still inspired by their work. Every day is a learning opportunity for us and our students,” said Thomas Horan, executive director of the Center. The answer to prayers came through a tie to one of the school’s former students. Charles Del Vecchio is the owner and CEO of Tropic Supply in Miami, a wholesaler of HVAC and mechanical systems. Del Vecchio and his son Chuck, president of the firm, were inspired to help through a close and personal look at the school’s plight. Chuck’s son, Chris, had been a student at the school for several years. Through the years, Tropic Supply had covered the cost of repairing the old chiller system. But the building’s existing system, based on a 40-ton, R-22 reciprocating chiller, cooling tower, and dozens of fan-coil units, deteriorated further each year. The key dilemma was the discovery that the chilled water piping, buried under the school, had ruptured. “The sisters and the students were having an awful time competing with the noise of the fan coil units,” said school principal Sister Lidia Valli. “We couldn’t decide what was worse, the hissing, whining, gurgling noises from the old room units, or the heat and humidity we all had to endure,” said facility manager Sister Carla Valentini. Charles Del Vecchio called Horan, the executive director of the Center, to say that they would cover the cost of new equipment for the school. “Needless to say, we were delighted,” said Horan. Considering the many problems with the old system, the Del Vecchio family and school administrators decided that the best solution would be to abandon the ruptured lines and to remove the chiller, cooling tower, and fan coil units. 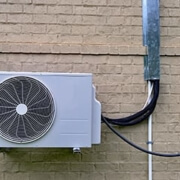 When it was apparent that the use of many smaller units would offer far greater efficiency, it was decided that 23 separate Fujitsu mini-split heat pumps would be installed. The Del Vecchio family, with the help of engineers at Formica & Associates, drew up plans for installation of ductless split systems that they would donate to the Center. Installation of new equipment began in the summer of 2009, with the work moving briskly in phases. “We began at one end of the building and completely installed and wired each new system, placing them online and ready for service,” said Garrison. “This took less than a month, start to finish.” During that time, the Garrison Mechanical crew enacted an earlier plan to make the indoor units fit into spaces where the old equipment had been. Wood enclosures, stained to match other furnishings, were installed to conceal and offer easy access to fresh air filtration, a Miami code requirement. The evaporator units were then attached to the outer face of these enclosures for an aesthetic touch that is greatly appreciated by the school.